Diamondback Terrapins are a species native to coastal marsh areas in New Jersey. Terrapins are an interesting species, in part because they are the only native New Jersey turtle that has adapted to marsh habitats. Diamondbacks have been spotted all over the Great Bay area, increasingly so in the Manahawkin-Long Beach Island area. Although their shells are extravagant and beautiful, sometimes it is hard to notice them in the water, especially when it is dark and murky. Terrapins can travel by water and land; neither is safer than the other in the busy water and road ways of Barnegat Bay. Diamondbacks in New Jersey have had a high mortality rate due to impact from cars and boats. In fact, only one in fifty hatchlings survive to a full-grown adult. One teacher and terrapin conservationist is trying to change that. Dr. John Wnek is a teacher at M.A.T.E.S High School in Manahawkin. Dr. Wnek is an avid terrapin conservationist and he incorporates it into his schoolwork as much as possible. For the past few years he has been rescuing terrapins in the Barnegat Bay area. Whether they are hit by a boat, a car, or trapped in a net, Dr. Wnek is there to help. He has many terrapins in his classroom, mostly those that he rescues. He introduced his love for terrapins to his students and they have joined in to help with a growing initiative, Project Terrapin. For this project, Dr. Wnek and his students distribute over one hundred terrapin hatchlings to coastal high schools and colleges in New Jersey. These students and teachers keep their turtles in the classroom and take care of them for almost a full school year. 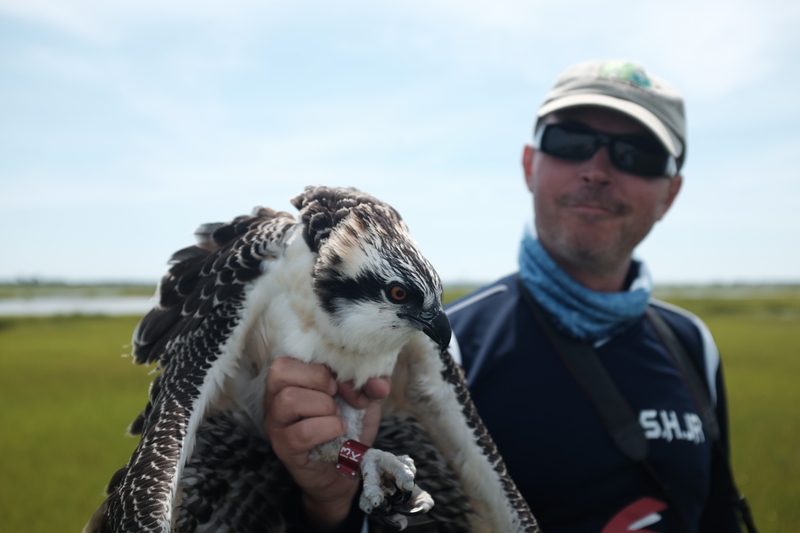 At the end of May every year, the students and teachers from each school join at Island Beach State Park to release the hatchlings into the Barnegat Bay. When the turtles are hatched in the wild, they sometimes do not even make it to the marsh water or bay. Predators, such as seagulls, can pick them up easily when they are so small. With the help from the schools, the terrapins are well fed and kept clean from diseases so they can finally be set free in their new homes. A very important part of maintaining the hatchlings while in the classroom is keeping track of them after they are released. Since the little turtles are too small to tag, we perform a procedure called notching. This process is like filing a human finger nail; it is quick, simple and painless. To notch a turtle shell, we use a filer to leave indents in the shell. As you can see from the pictures below, turtles have keratin plates that make up the shell, called scutes. In order to mark them accordingly to the year, we correlate each scute with the letter of the alphabet. This year we used the letters N and O, you can see the scutes that are marked on the hatchling and turtle. Once this process is complete, we finally set our little buddies go to where they can thrive and reproduce. 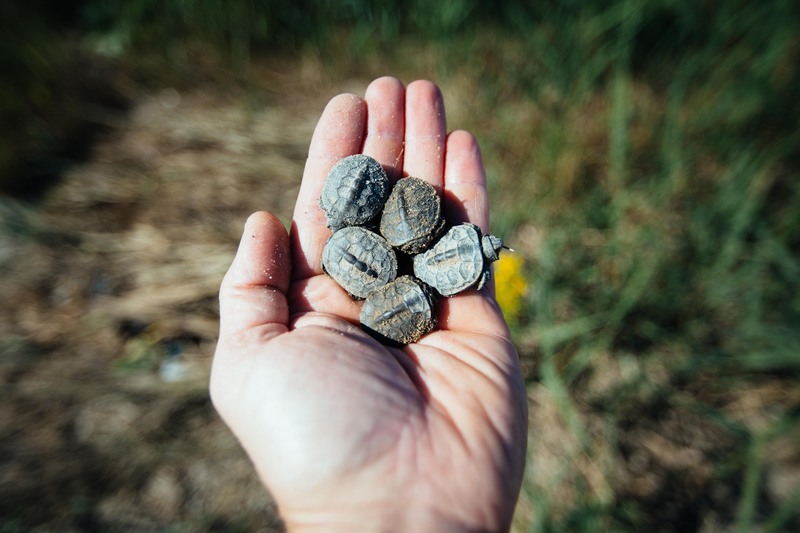 The goal of this project is to help replenish the diamondback terrapin population, with the help of Dr. Wnek and his students, the next generation of terrapin conservationists. Kiran Sinha is a summer 2015 Wildlife Conservation Intern with Conserve Wildlife Foundation of New Jersey and a 2015 field team member for Project Terrapin. Volunteers needed to help protect terrapins! A female terrapin pauses while crossing Great Bay Blvd in Little Egg Harbor, NJ. What we’ve done with them in Tuckerton and Little Egg Harbor is address a problem which was believed to be the root cause for their decline in the area. Studies that have been done in the area have stated that the overall size and age of terrapins has decreased over time. Another documented the total road mortality rate at 70% of individuals that crossed the road (the actual rate in a more recent study was around 30%, but that’s still high and having an impact). Either way, each year many terrapins are being injured and killed by motor vehicles. Each year we recruit volunteer “Terrapin Stewards” to help patrol area roads. This hardy and extremely dedicated group of volunteers work tirelessly to prevent terrapins from becoming road kill and also collect valuable data on their annual migration to find suitable nesting areas. On May 12th at 6:00pm we are hosting a short training session for anyone interested in volunteering this year. Attendees will also learn more about all of the work that we’ve done over the past 5 years. Posted in Volunteer Programs, Wildlife Protection | Comments Off on Volunteers needed to help protect terrapins! Interesting recaptures on Great Bay Blvd. ABINOQ. Photo by Ashley Hecht. Northern diamondback terrapins are known to have a very small home range. Some have only been found to occupy the same small creeks, year after year. To help study the size of terrapin populations in New Jersey researchers have used a method called mark and recapture. No one really knows the size of the terrapins population in New Jersey and throughout the range of the Northern subspecies, which ranges from Cape Cod to Cape Hatteras. A portion of the population is captured, marked, and released. The method is repeated and the number of marked individuals is counted and should reflect a proportional number of marked individuals in the entire population. 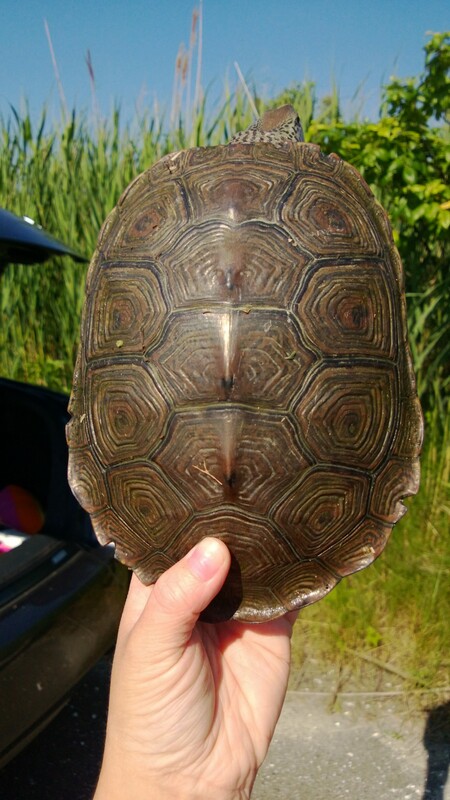 Since 2001 terrapins have been marked on Great and Barnegat Bays. This past summer we got hits on three females that were PIT tagged (it’s like the Home Again chip for your pet). Their tags were read during road patrols by our intern Ashley. Two of the three were linked back to previous captures. Each is ID’d by the notches on their carapace (upper shell). Each bridge scute on their carapace is assigned a alpha code. ACIJV – First encountered on June 20, 2008 at age 7. Weighed 805 grams with a carapace length of 157cm. She was recaptured again this summer by Ashley on June 9. She is now 12 years old and weighed 934grams. Her carapace was 170cm long. She moved only .86 miles or 4,561 feet from her last encounter, which is typically the small range seen in terrapins. 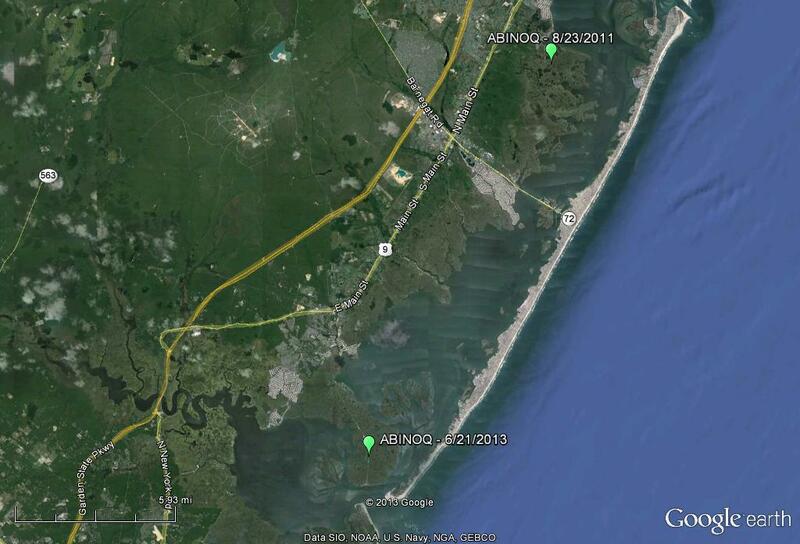 The second is ABINOQ – she was orginally trapped on Barnegat Bay (near Gunning River and the Barnegat Docks) on August 23, 2011. She was 8 when trapped and weighed 766 grams with a CL of 170mm. She was re-caught this summer while crossing Great Bay Blvd in Little Egg Harbor. This now makes her 10 years old and she weighed 965 grams and had a CL of 180mm. Now she moved a total of 16.7 miles in two years!! 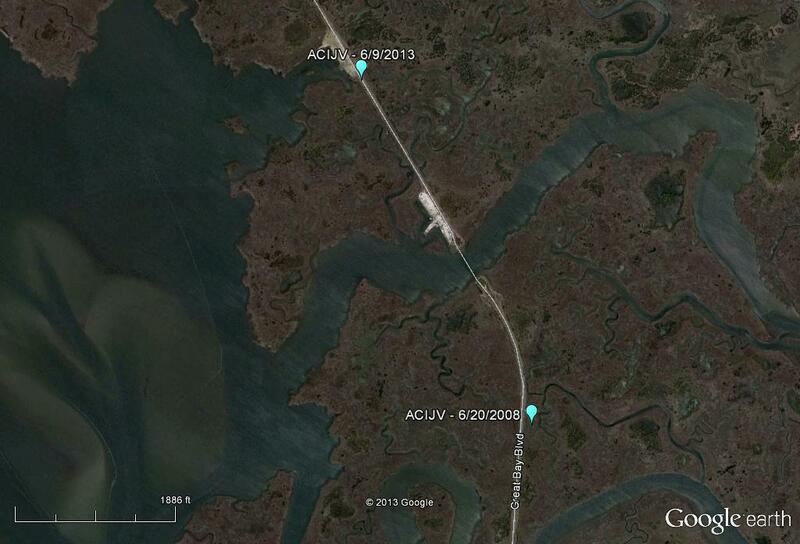 Natural movement of ACIJV around Great Bay Blvd. This is more typical of terrapins. The extent of ABINOQ’s range. I find it really hard to believe that ABINOQ traveled 16 miles south in two years. There are a couple ways that she could have moved that far south. Superstorm Sandy – I think that this is a good possibility. Usually in late October most terrapins should have been entering hibernation, but a few could have still been active. I got a couple calls shortly after the storm hit from residents in the Little Egg Harbor area who found displaced terrapins in their yards. Given the fact that upwards of 6 feet of water were forced onto the coastal marshes with the storm surge, this could have pushed ABINOQ south towards Great Bay Blvd, where she was encountered this summer. Human intervention – this is also a very likely scenario. 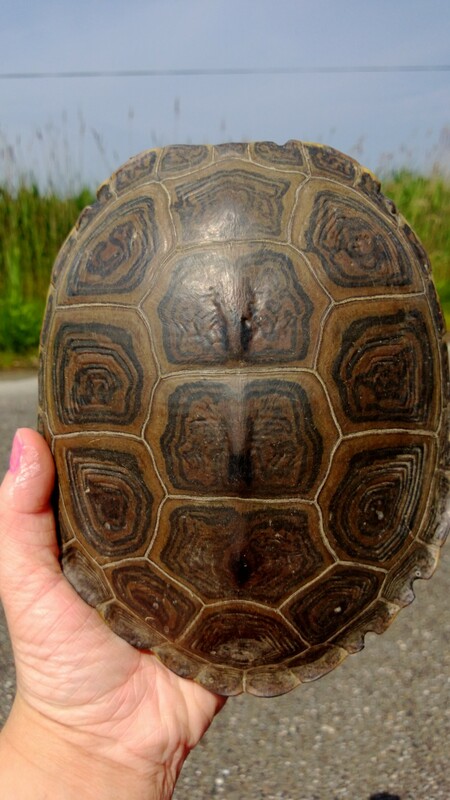 People often pick up terrapins when they find them on or near roads and sometimes take them home. Other times they take them and put them somewhere else, where they think they should belong… This summer I found a large female on an inland road in Upper Twp. (Cape May County). She was over 1.5 miles from any kind of brackish water…which is a long distance for any aquatic turtle to travel on land! These findings are really interesting and with the data collected we’ll be able to learn a lot more about the local terrapin population. We hope to expand the use of PIT tags readers by fundraising to purchase additional readers. If you’d like to donate to help us purchase one, please shoot me an email. ACIJV. Photo by Ashley Hecht. Posted in Reptiles, Wildlife Protection | Comments Off on Interesting recaptures on Great Bay Blvd.